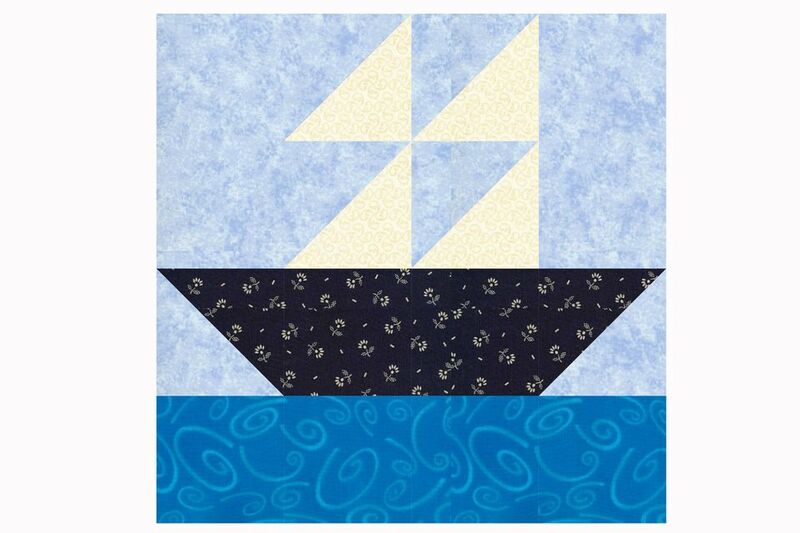 This sailboat quilt block pattern is constructed with half-square triangle units (also called triangle squares), plain squares, and rectangles. The design is an easy quilt block that goes together quickly and is a favorite for kids' quilts. A wavy blue fabric depicts the water underneath our boat and a mottled fabric represents the sky. Both fabrics give the quilt block a somewhat realistic look, but use any fabric you wish, because realism definitely isn't required. Cutting charts include instructions for two quilt block sizes, a 12" square finished block and a 6" square finished block that might be more appropriate for a child's quilt. You could mix the two block sizes—a cluster of four small blocks is the same size as one of the larger blocks. Make lots of identical blocks or sew a scrap quilt to vary the scene. A plain, narrow sashing, with or without cornerstones, would look good sewn between multiple Sailboat quilt blocks and would help you increase the quilt's size. Sew one or more borders to the quilt if you'd like to alter its size even more. Pair your mottled sky squares with your white squares. Set aside. Pair the remaining sky square with your black square. Use our quick piecing method to turn the square pairs into triangle square units: four sky/white and two sky/black. If you're making the 12" block, your completed units should measure 3-1/2" x 3-1/2". If you're making the 6" block, the completed units should measure 2" x 2". Refer to the illustration above as you assemble the quilt block. Use quarter inch seam allowances to sew patchwork and be sure to press with care. Sew the sky/white triangle square units into two rows, each row containing two units. Be sure to position the white sails as shown above. Press the seam allowance towards the sky fabric. Sew a sky rectangle to each side of the sails unit. Press seam allowances towards the sky rectangle. Sew a sky/black triangle square unit to each short end of the black boat rectangle. Check placement to be sure the lines of the boat match the illustration. Press seam allowances towards the black rectangle. Position the sea bar under the other two rows. Sew the three rows together to complete the quilt block. Press seam allowances towards the bottom of the block. The large quilt block should measure 12-1/2" x 12-1/2" square; the smaller block should measure 6-1/2" x 6-1/2" square. If your block is smaller than it should be, or skewed on one side, press and recheck. If it still isn't quite right, use our easy squaring-up method before sewing it to other blocks.